Home / Tech Talk / DINO Updated Paper: Mysteries of Buffer Optimization Solved! DINO Updated Paper: Mysteries of Buffer Optimization Solved! In some respects, IBM’s access methods (especially VSAM) are like software black boxes – you pass a request to them, they go off into the Enchanted Forest, and sometime later, data is either retrieved or written by your application. As application developers, we have some modicum of control over when, why, and how often we make requests to the access method. It is that second part of the process, the “sometime later,” that we view as a part of application performance that we seemingly have no means of influencing. For most applications, if the “sometime later” variable were lessened, the aggregate overhead experienced by an application would decrease. When the access method processes the data set on behalf of the application, it builds a buffering environment. Think of buffers as “temporary housing” for data records. The access method uses this temporary housing as a staging area for the data until it is needed for the program. As application owners, we know how our application accesses the data (sequentially, randomly, or some combination). If we combine that knowledge with knowledge of how the access method avails itself of the buffers in each of those access types, then we can define a unique buffering environment for each data set accessed by our application, and thus ensure optimal performance by the access method. environment and then make the needed alterations to their system (JCL, …) to define that specific environment. Improvements in application execution time can be quite dramatic. In some instances, over 90% of the EXCP SVCs issued against a data set are not just optimized, they are eliminated. This can result in tremendous savings. Low-level: Some solutions require guidance at a very low level, resulting in a high level of input from the user. Not only must the user identify the candidate s for optimization, they must also define (and monitor) the type of optimization that is to be performed. At this level, the buffering solution does not make that determination. 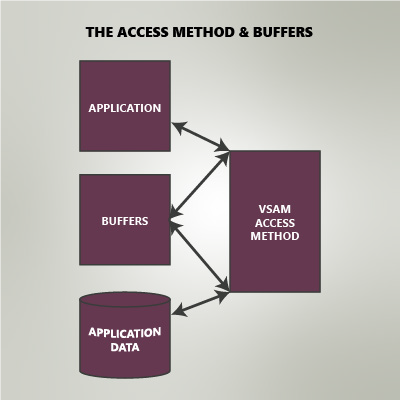 The access method – VSAM itself. VSAM has the responsibility of performing the actual I/O operands required to process your application’s data; either acquiring data from a disk drive, or writing data to a disk drive. The access method uses the buffering environment presented to it. The buffer optimizer. The buffer optimizer does not get involved with the actual I/O requests themselves. Instead, the buffer optimizer attempts to provide the best possible buffering environment for the access method (VSAM). The access method and the buffer optimizer partner together in processing an application’s data. The access method provides the needed services, and the buffer optimizer ensures the optimal use of those services. What happens when the lines get blurred? Can the access method replace the buffer optimizer? Or, can the buffer optimizer replace the access method? Some programmatic solutions to I/O performance have attempted to do one or both by either implementing the use of an alternate IBM access method or by completely replacing an IBM access method with a proprietary access method and data format. While these solutions (the use of alternate access methods, whether IBM or proprietary) may initially seem to be viable solutions, closer investigation does reveal some areas of concern. Implementing alternate IBM access methods: Historically, proposed solutions involve the use of other methodologies and access methods when performing specific tasks (such as loading a VSAM data set). Design: The design behind this methodology involves the replacement of normal VSAM processing with a faster interface being used to perform the processing. Concerns: Since VSAM processing is actually bypassed, the solution must internally provide all processing normally performed by VSAM (for example, key compression, index level processing, …). Solutions based upon this design are susceptible to internal changes in IBM processing. Failure to account for those changes could lead to data corruption and/or loss. Replacing IBM access methods with proprietary access methods: In this scenario, the IBM VSAM access method is completely replaced with a proprietary access method and data format. The design behind this methodology stresses the superiority of the proprietary access method over IBM’s VSAM access method. 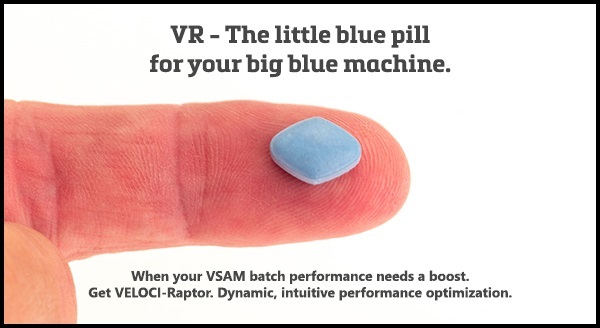 Most buffer optimization products work within the framework provided by VSAM and the operating system. As such, they do not modify the actual format and organization of the user data. Access method replacement products require a user to convert their data sets from IBM’s VSAM format to a proprietary, non-VSAM format. All data sets using the replacement access method must first be converted to this non-VSAM format. All converted data sets are now in a proprietary data format and cannot be accessed by the native VSAM access method. While the VSAM access method is provided as an integral part of the operating system, access method replacement products can be expensive. To access the data sets on a system where the access method replacement product is not active, the data set must first be converted back to IBM VSAM format. Native IBM VSAM can no longer be used to access the data. Trialing and implementation of such products is more complex and labor-intensive than the processes associated with a buffer optimization product. Since each data set must be converted from VSAM into a format acceptable to the proprietary access method, each prospective data set must be converted prior to its use with the access method replacement product. For test data, this may not be a major issue. But, with production data, this leads to the necessity of parallel copies of the prospective data sets – to keep production data separate from the test data (which is converted into the proprietary data format for the trial process). The access method replacement product must be installed and active in order to access the data. This could be a concern during disaster recovery. Support for your application’s data access is no longer through IBM (since VSAM is not being used). Since VSAM is not being used, support for new IBM features in VSAM may not be possible in an access method replacement product, or may not be implemented on a timely basis by the access method replacement product vendor, thus limiting their availability to a user. Because of the resources invested in the access method replacement, in both the real cost of the product and the man-power invested in the trialing of, conversion to, and maintenance of the product, a long-term commitment may be necessary in order to see a return on your investment. Bill Hitefield has been involved with IBM mainframes since the late 1970s. He has concentrated on VSAM buffer optimization for the past 30 years and is currently the Product Manager for VELOCI-Raptor with Dino-Software. VELOCI-Raptor (VR) is a dynamic performance optimization tool designed to dramatically improve system performance while significantly reducing system overhead by automating tuning activities. VR reduces overhead by optimally allocating buffers for VSAM and non-VSAM files to provide the best throughput and response time for I/O requests. For more information on VELOCI-Raptor, visit https://velociraptordinosoftware.com.